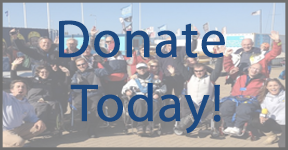 Please visit our MyDonate page to donate to Chesil Sailability > https://mydonate.bt.com/charities/chesilsailability. Chesil Sailability is entirely run by volunteers. We charge a small and affordable fee for sailing sessions, but this only makes a small contribution to our overall running costs. We have to raise the rest ourselves - and we do lots of fundraising (see here) and apply for grants too. If you would like to donate money by cheque, or BACS transfer, please contact us. Every bit helps enourmously!